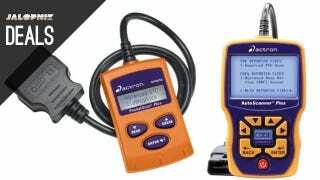 Amazon's Gold Box deal of the day is offering big discounts on several Actron OBD-II scanners for diagnosing your check engine lights. The cheapest model comes in at $48, which is more than some entry level scanners, but it has some higher end features like built-in code definitions, and vehicle VIN display. Either of these deals should be a great upgrade for your garage door. Want to stock up on headlight bulbs, or just upgrade the dim ones that came with your car? Amazon has some nice coupons for you to check out today. Cool Gear Food Storage Variety Pack ($17) | Meh. refurb Sanyo 39" 1080p TV ($200 ) | woot!